Minimalism in backpacking has become a growing trend, but all too often leaving the user lacking performance and comfort in pursuit of a minimal pack weight. The Siren Quilt from Nemo has the weight savings and simplicity associated with minimalism, but without sacrificing performance or comfort. 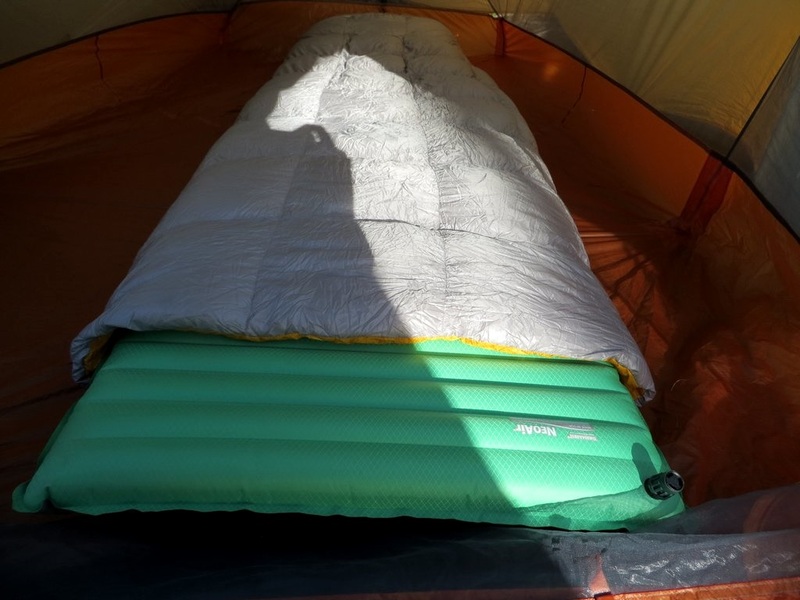 The quilt is built from a feathery 10 denier ripstop nylon with a DWR treatment to help shed water and moisture. 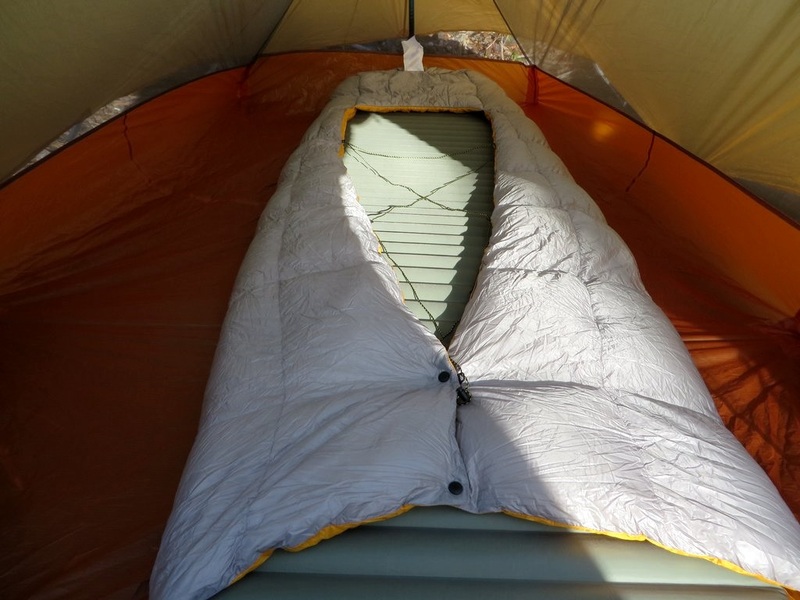 The quilt forgoes zippers altogether, and instead allows you to wrap the “sleeping bag” around your sleeping pad for locking in warmth. This works by sliding your sleeping pad into the foot box of the quilt, and a zigzagging lacing system around the back of the quilt secures it in place. At the head of the quilt you’ll find two clips that allow you to snug down the quilt even closer to prevent heat loss around the neck. The quilt can also be used as a traditional quilt, without attaching to the pad for warmer nights, and the laces are removable. The fill is a high loft, low weight 850 Power Down. The whole quilt only weights 1 lb, 3 oz and retails for $349. At just a bump over 1 lb, I couldn’t image this quilt actually keeping me warm on a frosty 30 degree night. With the quilt strapped to my insulated pad on a gusty night on a relatively exposed peak, I was happily proved wrong as the temperatures dropped below the temperature rating and I was toasty warm, even almost sweating with nothing on but a t-shirt and pants. Simplicity is king. Simply cover up and you’re all set for a long nights sleep on warmer nights, or slide your pad through the opening for added warmth and a breeze free heat bubble. 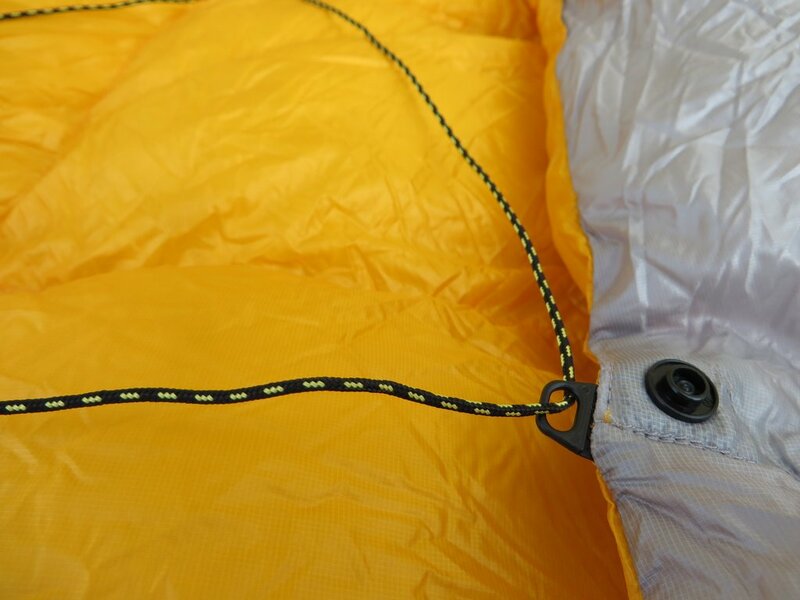 If you’re still cold, use the clips around the neck and tighten down the laces, which minimizes the volume of air to heat inside the quilt, for a final boosts in leak free warmth. This creates an impressively wide comfortable usable temperature range, from 30 degrees all the way through summer. The squared baffles do an exceptional job of keeping the down in place while tossing and turning during the night. The improved dispersion creates and even, reliable insulation without resulting in cold spots. With the laces cinched up tight, I was still able to sleep in all positions, and the wrapping nature of the quilt prevented my arms from falling off the pad. Build quality all around was solid. I never once felt like I needed to baby the quilt, despite the ultralight materials. Humidity and moisture was never a problem thanks in large by the DWR treated body and fill. Once strapping the quilt down to your pad, it’s a little bit of a pain to get into and out of. You’ll have to slide in from the top, or shimmy the quilt around you and your pad. It’s not ideal, but on those surprise sub freezing nights it’s worth the effort. It was just long enough for me at 5′ 8″ to wrap the quilt around my neck for a brilliantly snugly neck collar, but taller campers may find it’s not quite long enough to cinch down around their neck, resulting in a draft. Wider sleepers may find the internal volume too tight and restrictive when attached to the pad without loosening up the straps. 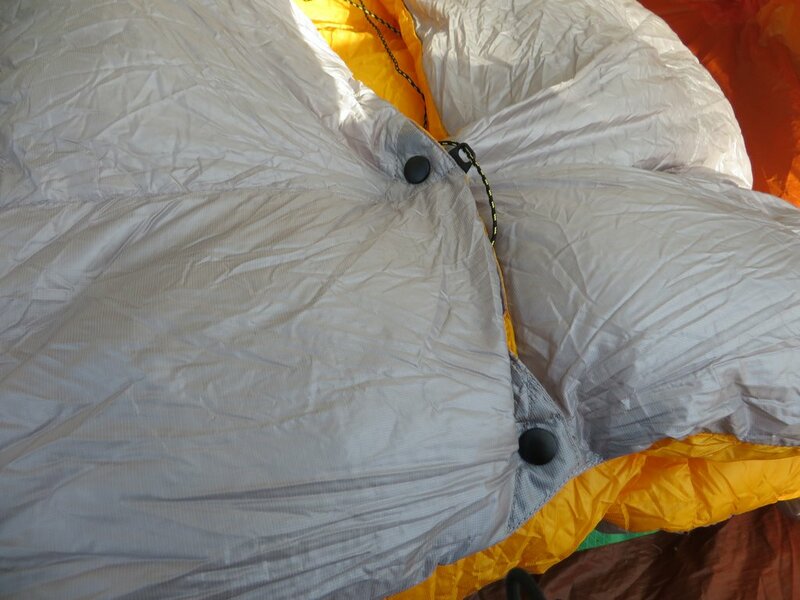 Wide or abnormally thick pads (more than 3 inches thick or 20 inches wide) are pretty much incompatible with the quilt’s attachment system for all but the smallest of campers, as they can make the bag too tight and cramped to get into and out of easily. You can still happily use it as a top quilt however. 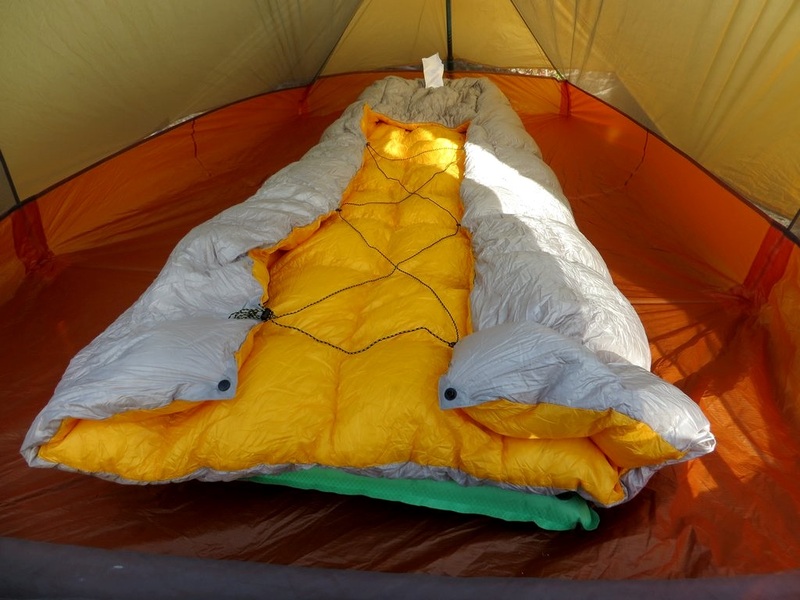 As with all sleeping bags and quilts, overall warmth will also depend on how warm your sleeping pad is. My test kit was paired pad with a high R-value of 4.9 (higher is warmer). The Siren by Nemo is an impressively light, warm, and diverse piece of equipment that has exceeded all of my expectations. If you’re in the market for the lightest, without sacrificing comfort, this is an exceptional piece of equipment that I can’t recommend enough.